Two of our pullets have started to lay but not the two I would have expected. We keep blue egg layers for a number of reasons. First, customers appreciate the novelty. Well, most of them do. Second, it is an easy way to keep two flocks in the same place and still know whose eggs are whose. 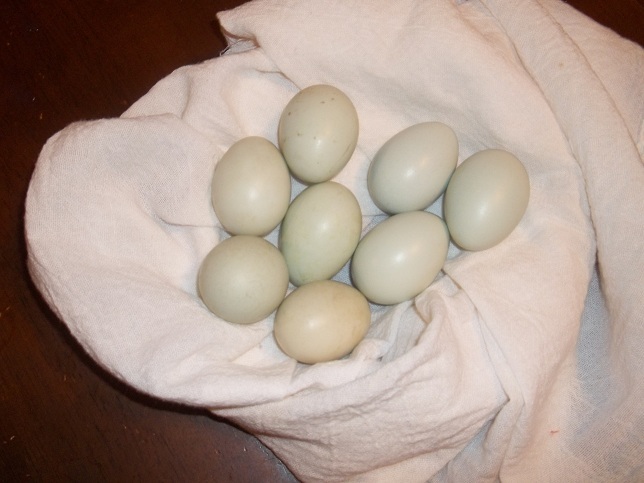 In the past, the blue eggs have been from my daughter’s flock so she earns a little money each day. I have never purchased Ameraucana chicks, always started pullets. Though they are pretty, I have never really been impressed with the birds as layers. Without exception they have been late to lay and inconsistent layers in winter. This isn’t just an impression I carry, the birds are a difficult sell to local egg producers as started pullets. This year I ordered 50 Ameraucana pullets from Cackle hatchery. Not only are they nice, colorful birds, they are the first in the flock to begin laying eggs. Where are the brown eggs? We also keep hybrid layers and RIR pullets from Central hatchery out there. I would have expected to see something out of the hybrid layers by now. All pullets are the same age…hatched on the same day (Feb 28), even though they came from two different hatcheries. This entry was posted in Pastured Poultry and tagged Americauna Pullets, Egg Production. Bookmark the permalink.